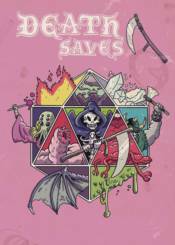 Death Saves: Fallen Heroes of the Kitchen Table collects 17 all-new comic book stories about what happens when fantasy gaming characters run out of hit points. Some tales in Death Saves are funny, others tragic. Every group is different. However, the real relationships between players often impact a character's fate more than the dice.